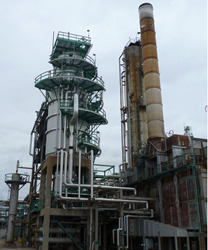 The existing vacuum tower was nearing end of life and needed to be replaced. The vacuum tower PSV was originally vented to atmosphere and the new design required the PSV to be vented to the existing flare header approximately 200 ft away to prevent release to atmosphere. 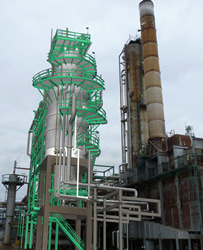 The vacuum tower was redesigned for a higher back pressure and improved access and safety. Laser scan technology was used to helped achieve little to no rework during construction. Project was divided into pre-shutdown, shutdown, and post shutdown work. To remove the vacuum tower, lifting and tailing lugs had to be designed and installed. Vacuum condensers and ejectors and associated piping, instrumentation and electrical were also replaced. The new tower was “pre-dressed” to the extend feasible to minimize down time during the turnaround. A new platform was required to integrate the existing access stairway to the Tower. 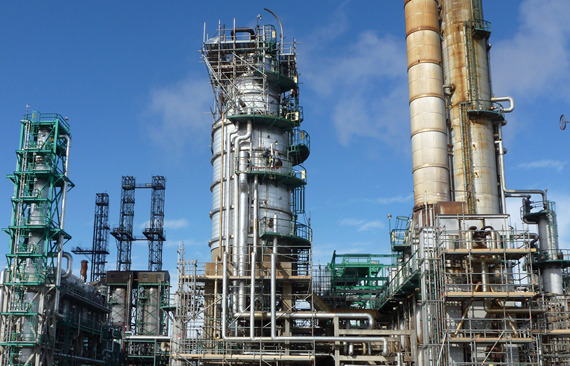 The design included all piping, structural steel, electrical, instrumentation and tie-ins to the existing plant. Electrical heat tracing was planned and installed post shutdown. Responsible for coordinating construction and providing field support. Working closely with our client and contractors was key to completing this project safely on time and under budget.